Most wars that the United States would have to be involved in has some kind of protest back at home. 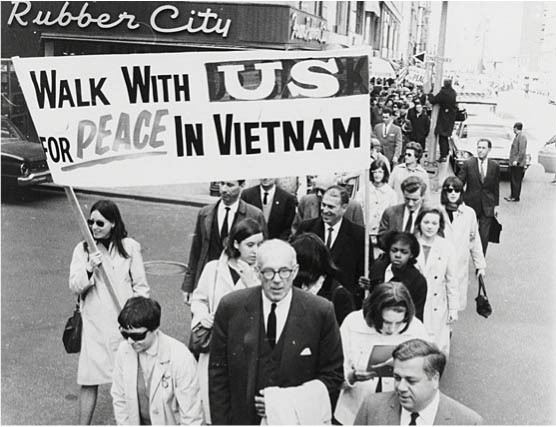 During the Vietnam War, there were so many protest movements about the Vietnam War that it went down in history books as one of the most protested war. Most of the movements were students that were becoming more active socially and in the political world. One of the movements is called The New Left which was "new" in relation to the "old left" of the 1930s. Its mission was to try and move the nation toward socialism and in some case communism. This movement moved right into the Students for a Democratic Society (SDS), who's mission was that corporations and large government institutions has taken over America. In April of 1965, the SDS helped organize a march on Washington D.C. and in November of that same year, the protest grew from 20,000 to 30,000. These youth movements has many reasons on why these protests came about. One of the main reasons was that the Vietnam War was basically a civil war and that the United States military had no business in Vietnam. There are other reasons, but other protesters saw the war as morally unjust. The protests went on and on during the Vietnam War, and as the war went on, so did the protesting. Protesting was getting so intense that it eventually divided the country between two camps, doves (who strongly opposed the war and believed that the U.S. should withdraw) or hawks (who feels just as strong as the doves and the U.S. should unleash much of its greater military force to win the war). With all of this, the longer the war was, the longer the protesting.